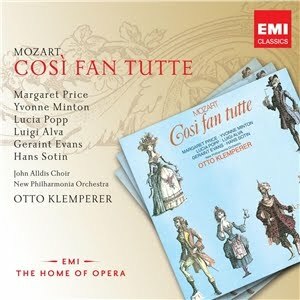 One obvious casting strength of the Klemperer Così is his pair of sisters, the formidable Margaret Price as Fiordiligi and Yvonne Minton as Dorabella, and so in the selections for the original Margaret Price-themed post I devoted most attention to excerpts featuring them. I should that, because I did Fiordiligi's two great arias fairly extensively in that post, offering not just Margaret Price's heroic performances but performances by Teresa Stich-Randall, Irmgard Seefried (from the Jochum-DG Così), Leontyne Price, and René Fleming, we're not going to revisit them at all. Also, I'm sorry, but I still haven't incorporated an excerpt featuring Klemperer's Despina, Lucia Popp. Act I, Duet, Fiordiligi-Dorabella, "Ah guarda, sorella"
Do not seem to flash forth! Of a soldier and a lover. FIORDILIGI and DORABELLA: How happy I am! Act I, Quintet, "Sento, o Dio"
In their progress towards you. A hero calls up all his strength. If I must abandon you. DORABELLA [to GUGLIELMO]: No, no, do not go! FIORDILIGI [to FERRANDO]: Cruel one, do not leave me! DORABELLA: I would sooner tear my heart out! FIORDILIGI: I would sooner die at your feet! FERRANDO [aside, to DON ALFONSO]: What did I say? GUGLIELMO [aside, to DON ALFONSO]: Do you see now? We've not reached the end yet! Can ever more delight in life? Act I, Quintet, "Di scrivermi ogni giorno"
FIORDILIGI and DORABELLA: I'm dying of breathlessness. DORABELLA [weeping]: Write me twice as often, if you can. 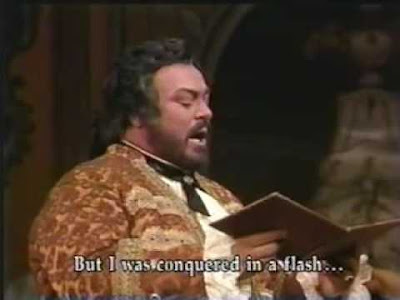 GUGLIELMO: Never doubt me, my dear! FERRANDO: Rest assured, my love! 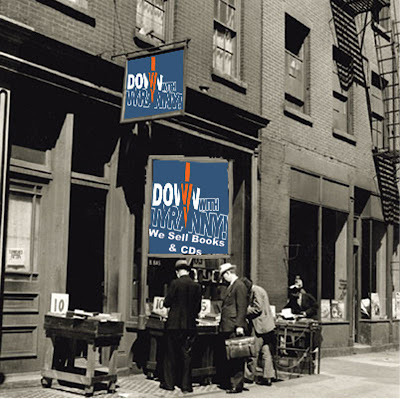 DON ALFONSO [to himself]: I'll burst if I don't laugh! FIORDILIGI: Be true to me alone! FIORDILIGI, DORABELLA, FERRANDO, and GUGLIELMO: Farewell! My heart is rent in twain, my love. Act II, Recitative and Duet, Fiordiligi and Dorabella, "Questo è ver" . . . "Prenderò quel brunettino"
If there should be a scandal. When we're taking such precautions? Which of these two Narcissi do you fancy for yourself? Who seems to me more fun. And joke a bit with the fair one. We start, of course, with those two great powerhouse movements, the Allegro moderato and the Adagio. That the dominant mood is elegiac is for me reinforced by the odd sensation that these are both slow movements and both -- notwithstanding the actual tonality, E major -- in minor mode. Bruckner was always central to Herbert von Karajan's repertory, and the Seventh Symphony was a particular specialty. His special mastery of the full resources of the symphony orchestra was regularly channeled into a masterful delivery of what we might call the standard traditional Germanic understanding of the piece -- including two lovely earlier recordings with his own Berlin Philharmonic. I think you'll hear here that Carlo Maria Giulini, a great Brucknerian (we heard some of his remarkable 1974 EMI recording of the Second Symphony with the Vienna Symphony in the aforementioned post on that work, and if we ever get around to "doing" the Bruckner Ninth, we'll certainly be dipping into his terrifying, blood-drenched second recording, with the Vienna Philharmonic) who had unusual access to the dark, depressed side of the composer's imaginings, lives the music at a somewhat higher intensity level. The great Adagio of the Seventh -- which we heard first in the January 2010 post, "Adagio -- moving slowly from Beethoven through Bruckner to Mahler" -- became associated in Bruckner's mind with Wagner through the accident of his hero's death while he was actively engaged with its composition. But while the movement is clearly elegiac in tone, it's hard to believe that it was ever imagined as an elegy to any particular individual. This may be the most beautiful movement Bruckner ever composed, and for all its breadth and expansiveness undoubtedly also one of the hardest to miss the point(s) of. I think we have a couple of really special performances here, though. Both Eugen Jochum and Karl Böhm had been not only conducting but recording Bruckner since the '30s, and while Jochum took a perhaps more optimistic view than I'm inclined to, his close personal identification with the music was one of the great musical identifications -- nobody managed the great climax of the Adagio more ringingly than he did, and in recorded performances from all over the musical map, which adapted to a larger degree than one might expect to the particular qualities of the orchestra he was conducting. This live performance from Vienna seems to me at once utterly representative of his way with the Bruckner Seventh and special for its embrace of the Vienna Philharmonic. As for Böhm, Bruckner figured less in the concert activity of his later decades, but fortunately his record companies. Decca produced excellent stereo versions of the Third and Fourth Symphonies (if I could have only one recording of the Fourth, it would probably be this one), and in 1976 DG made gorgeous recordings of the Seventh and Eighth for release originally as a three-LP set (the symphonies have been released as single CDs) -- all with the Vienna Philharmonic, naturally. It may be worth considering that while both Bruckner and Böhm were adoptively Viennese, they in fact both hailed from Austria's "other" major cities -- Bruckner from Linz, Böhm from Graz. The coming of electrical recording coincided with the publication, finally, of editions of Bruckner's symphonies that attempted to re-create some version of the composer's own conceptions rather than the heavily reworked editions prepared by well-meaning friends and disciples. Considering how cumbersomely a Bruckner symphony fit onto 78s, it's remarkable how much recording was done in the '30s, and at the forefront were none other than Jochum and arl Böhm, recording mostly in their then-musical homes, Hamburg and Dresden, respectively. Jochum's Seventh was done in Vienna, however, and we also have this lovely wartime Böhm Seventh from Vienna. I thought we might hear the Adagio from both. This is the movement we heard in Friday night's "Two scherzos" preview post, set alongside the Scherzo of the Bruckner Fourth Symphony. As I noted, the Scherzo of the Seventh isn't that much shorter than that of the Fourth, but in its proper place it is dwarfed by the two giant movements that precede it. The Scherzo of the Fourth seems to me a much fuller, more rounded musical experience, as against the more monomaniacal quality of the Scherzo of the Seventh, which almost seems to be running from ghosts haunting the earlier movements. The finale of the Seventh is almost anti-Brucknerian in its concision and getting-to-the-pointness. Usually Bruckner liked to recapitulate and ruminate in his finales. 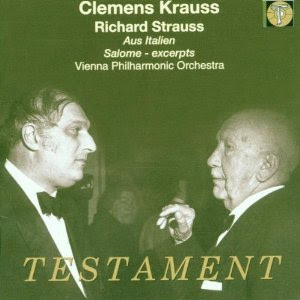 Clemens Krauss's 1953 recording of Aus Italien was available for a while in a CD issue by Testament which undoubtedly sounded a lot better than the dub I've done below from my LP. Strauss actually wrote a program for Aus Italien, but this only increased the confusion that the piece was some sort of musical travelogue rather than a set of four musical impressions of Italy. You'll note Strauss's incorporation of "Funiculì, funiculà," which he clearly must have thought was a folksong, only to find himself on the receiving -- and losing -- end of a lawsuit by its composer, Luigi Denza. It is what we're presumably meant to take as a typical morning at home in Vienna with the Feldmarschallin (i.e., wife of the Field Marshall) Princess Werdenberg. We're in her boudoir, where a veritable circus of personal-service providers, purveyors of diversions, and supplicants have found their way, and are singly and overlappingly doing whatever it is they came to do in the great lady's presence. Also on hand, to the Marschallin's considerable annoyance, is unpleasant cousin, Baron Ochs of Lerchenau (whom we met briefly in the February 2010 post "Glimpses of the musical depths of Richard Strauss"), leaning on her for assorted assistance in the planning for his impending nuptials. As our scene begins, an Italian tenor, accompanied (in both senses) by a flutist, sets up to sing. Meanwhile the Baron has commandeered the Marschallin's Notary, and is dictating greed-besotted, not to mention illegal, terms for a wedding settlement outside the actual wedding agreement. R. STRAUSS: Der Rosenkavalier, Op. 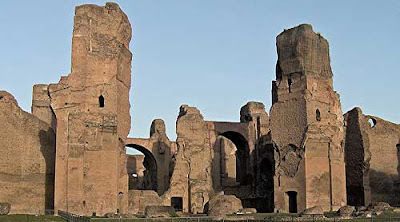 59: Act I, Italian Singer, "Di rigori armato"
After the Singer has managed to get in an entire stanza of his song, we hear the exchange between the Baron and the Notary, which becomes increasingly unpleasant. At a propitious moment the Singer launches a second stanza, but the quarrel between the Baron and the Notary becomes so heated that the startled Singer breaks off. With Richard Strauss, however, it's not entirely unknown for him to have written music that's more indelibly beautiful than the situation calls for. In this very opera, for example, I raised the question here when we dipped into Act II and met Baron Ochs's (monstrously) intended bride, young Sophie von Faninal. A lot of her music is of such astounding beauty -- a level of splendor probably obtainable by maybe two or three other composers -- that it's hard to believe it doesn't tell us something about an inner radiance. I certainly experience that, but I have to acknowledge the possibility, at least, that Strauss may simply have overshot. 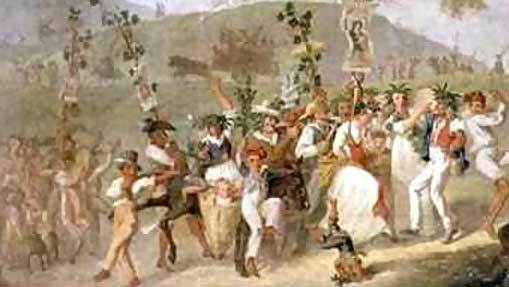 Quite apart from this exercise in Italianness, the young Strauss himself had an idyllic Italian experience, which inspired his first symphonic poem, appropriately titled Aus Italien (From Italy). 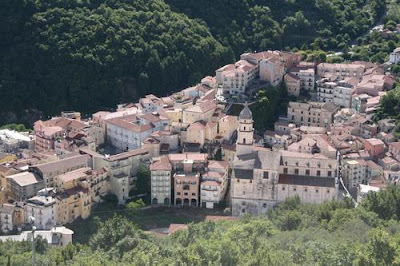 Sunday we're going to listen to Aus Italien. The Boston-based conductorless chamber orchestra A Far Cry plays a chamber-orchestra arrangement of the finale of Souvenir de Florence in Jordan Hall, January 2010. "I wrote [the sextet] with the greatest pleasure and enthusiasm, and no effort whatever." The quotation at the top of this post -- in which Tchaikovsky attempts to answer his patron Nadezhda von Meck's question about how he set about composing -- formed the introduction to an interesting but unfortunately uncredited liner note for the Melodiya-Angel LP issue of the 1964 Borodin Quartet & Friends recording of Souvenir de Florence. (A wild guess would be Rory Guy, who I recall wrote a lot of liner notes for the Melodiya-Angel issues.) If anyone happens to know who the author is, I'd love to be able to credit him. La bella Firenze. To the beautiful city on the Arno Tchaikovsky owed what he was to call "the happiest moments of my life." In times of personal stress, overwork, or in desperate need of simple relaxation, the composer was to return again and again to the sunlit streets and lichen-covered walls of his beloved Florence. In 1878, upon completion of Yevgeny Onegin and the Fourth Symphony (which he was to program while "vacationing"), he setttled in Florence to rest in the early Italian spring with its profusion of violets and lilies of the valley, the bells of a hundred towers ringing out in the morning air, blending with the trumpets which were to appear later in his Capriccio italien (1880). And the city was also to give him, ironically, a gentle nostalgia for the Moscow cold which he had fled. Writing once again to Mme von Meck he says: "How odd, how strange, but at the same time how sweet to think of my faraway, inexpressibly beloved home! There it is winter -- Muscovites, men and women, walk by your house wrapped in furs, the quiet is not disturbed even by the noise of carriages, the sleighs slide silently by . . . and I think of that winter not with aversion but with delight . . . one waits and waits for Lent to come, and with it the first signs of spring . . . with what affection one greets the first green grass . . . Here [in Florence] the spring comes on slow feet, little by little -- one cannot say exactly when she has arrived. And I cannot be moved by the sight of green grass when I have had it before my eyes in December and January." And although Florence in March was magnificent that year, a restless Tchaikovsky moved on to the cold of Switzerland, which he found somehow refreshing. Yet December of the same year was to find him once again turning to Florence for much-needed rest and inspiration. But this time was to serve the composer in a special way. For three short months he dwelled in the calm he treasured, in the Florence he adored. . . . It was due completely to the largesse of . . . his patroness and correspondent, Mme von Meck, that Tchaikovsky found himself basking in the Florentine sun, far removed from the rigors of the Russian winter. . . . 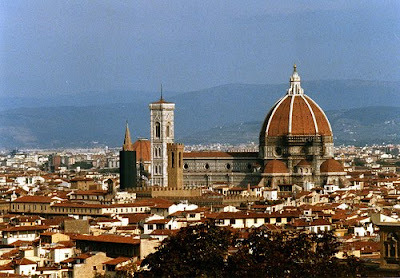 When he arrived at the spacious apartment she had found for him near her own Villa Oppenheim on the edge of Florence, a note typical of Mme von Meck awaited him. . . . [His] reply was particularly warm: Truly, dear friend, I cannot find words for my complete delight in everything that surrounds me here. I could not imagine more ideal living conditions. Last night I roamed through my charming apartment enjoying the wonderful stillness, aware that below my feet was the lovely town of Florence. When I opened the shutters this morning, the charm grew. . . . I can't describe my delight at the complete stillness of the evening, in which one hears only the roaring of the waters of the Arno, falling and tumbling somewhere in the distance. . . . I shall begin work tomorrow." . . . When he was to leave for Christmas in Moscow he wrote: "I was happy here, and at peace; it was light and bright in my soul. . . . I did not accomplish my goal of leaving Florence with a completely finished suite. Nevertheless, I began an opera [The Maid of Orleans] . . . Therefore I can take away with me, not only wonderful memories, but a quiet conscience." Wonderful memories. Some twelve years later, in 1890, after another rewarding stay (January to March) in Florence during which he composed his most popular opera, Pikovaya Dama (The Queen of Spades), Tchaikovsky returned to Russian and from Froslovskoe, near Klin, he wrote to Mme von Meck in July: "I had barely finished the opera before taking up a new piece, the sketch of which I have already completed. I hope you will be pleased to hear I have composed a sextet for strings. I know your love of chamber music, and I am happy you will certainly hear my sextet. It will be quite easy to arrange a performance at home. [Mme von Meck was ill at this time.] I do so hope the work will please you. . . . I wrote it with the greatest pleasure and enthusiasm, and no effort whatever." This then is the Souvenir de Florence. Although strongly Russian in its influences, there are lingering traces of Florentine Romanticism, particularly in the Adagio. 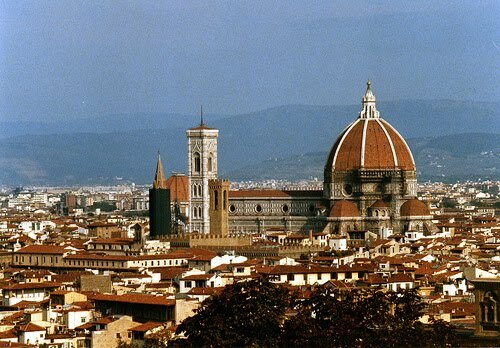 And this is as it should be; for how could it be otherwise from the pen of a Russian composer writing, in retrospect, a tribute to La bella Firenze, his city of dreams. While he was actually working on the composition, Tchaikovsky wrote to his brother Modest: "I do not merely want to write a musical composition arranged for six instruments, but specifically a sextet; that is, six independent voices which can be performed only and exactly as a septet. . . . "
That was in June 1890. In November of that year, while in St. Petersburg for rehearsals of Pikovaya Dama, the composer held a private performance of the Sextet before such friends as Glazunov and Liadov. Seemingly dissatisfied with this first hearing, Tchaikovsky spent the next two years refining the Scherzo and the Finale. It was not until 1892, one year before his death, that the Sextet received its first public performance, by the St. Petersburg Music Society, to which the work was dedicated. Then, as now, the beauty and unsurpassed craftsmanship of the Souvenir de Florence did much to establish Tchaikovsky as perhaps the most gifted founder of Russian chamber music. I know I should probably say something about the individual movements, and readers who feel cheated have every reason to demand their money back. (Consider it done!) Let me just note that it's hardly unusual for works in what we might call "four-movement symphonic form" to have an opening movement and an ensuing slow movement of such emotional weight as to dominate the whole piece. Haydn was already doing it when he invented the form, in both symphonies and string quartets. It's the format of the wonderful Symphony No. 88, with the otherworldly slow movement, which we heard in September 2010.) It's also the format of Mendelssohn's Italian Symphony, which we heard last week. Bruckner, who supersized everything else about the symphony, also supersized this ratio in his Seventh Symphony, which has that massive opening movement and then that haunting Adagio, followed by an invigorating but comparatively brief Scherzo and Finale. The trick is to have those later movements hold up their end of the deal even while conceding emotional primacy to the first two movements. This is in marked contrast to Bruckner's differently remarkable achievement in the Fourth Symphony: producing four movements of roughly equal musical and emotional weight. (We actually took in the whole shebang in January 2010, in "Bruckner's Fourth Symphony -- four stories for four movements." ) It just goes to show that there really aren't any rules about any of this, that it's all about what you can make work. Let the record show that I reserve the right to come back at some point in the future and say something more about one or more of these movements. For now, please just enjoy them! 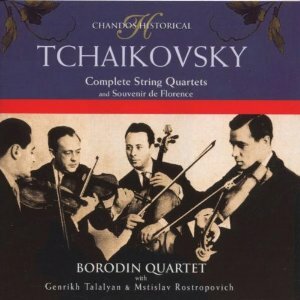 I should note that this performance has been reissued by Chandos in a set that includes the Borodin's wonderful recording of Tchaikovsky's three string quartets, as part of a series of recordings by the Dubinsky-led Borodin. I haven't heard the reissue, having been a bit thrown by the sound of Chandos's desperately needed reissue of the indispensable Dubinsky-led Borodin set of the 13 Shostakovich quartets that existed as of the time Dubinsky emigrated from the Soviet Union. Maybe somebody out there knows more about this recording than I do? I was unfamiliar with it until I stumbled across it online, and wasn't even able to come up with a date. (The "no later than 1963" cutoff comes, of course, from the untimely demise of cellist Sviatoslav Knushevitsky.) It's certainly an, er, interesting -- very interesting -- performance. This curiously matched assemblage of big-league talents seems to have just gone ahead and played the piece without feeling any need to hammer out some sort of common view of it. Leonid Kogan (1924-1982), rather a flamboyant violinist, was nevertheless one of the Soviet Union's most distinguished. Elizaveta Gilels (1919-2008), although a fine musician in her own right, was doomed to be best known as the wife of Leonid Kogan and the younger sister of the great pianist Emil Gilels (1916-1985). I'm going to assume that Mstislav Rostropovich (1927-2007), surely the greatest cellist of the recorded era (I hesitate only over the tragically short-lived Emanuel Feuermann) needs no introduction (I assume he's playing the first cello part here), but Sviatoslav Knushevitsky (1908-1963) was hardly less distinguished. He was a cherished colleague of violinist David Oistrakh (1908-1974); they partnered with pianist Lev Oborin (1907-1974) to form one of the finest of all piano trios. WHOLE SEXTET SOUNDS IN ORCHESTRAL FORM . . . Here's a performance I stumbled across online, with the Philharmonia Orchestra under the Korean conductor Djong Victorin Yu. Yes, come July 11 it will be two years since I last undertook the weekly drudgery of updating this already large and growing massive . . . er, thing. I had the feeling that while I wished it mattered, it didn't, to anybody but me. And every time I think of resurrecting it, and contemplate the scale of the task (which of course grows larger by the month; since I don't think I've sk ipped a week in those years, we're talking -- as of this week -- some 104 posts, plus previews, that would need to be "processed"), I have the same feeling. Actually, there have been so many posts now that both my memory and the search engines are increasingly unequal to the task of revealing and retrieving what's been covered. Well, the index updated as of 7/11/10 still exists, and against the possibility that it may, for someone, be of interest, I thought I'd dust the link off. Here it is. And here's the Duomo in daylight. As I said, were going to hear it first as it was composed, for string sextet, played by the Borodin Quartet in its glory years, with a pair of pretty high-class colleagues. (The "extra" violist and cellist were aptly billed in the original Melodiya-Angel LP release as "special guest artists.") As you listen, bear in mind that the composer thought of this as an ensemble of six solo instruments. After the beautiful fading-away chordal introduction, the first voice we hear sounding the haunting principal theme -- over his colleagues' pizzicato -- is the Borodin's founding first violinist, Rostislav Dubinsky, followed then by the first cellist, which I assume is the Borodin's longtime cellist Valentin Berlinsky. Afterward, we hear the movement in string-orchestra form as conducted by Sunday Classics' Mr. Dependable, David Zinman. We'll be taking in -- what else -- the whole of Tchaikovsky's Souvenir de Florence. In this master-class excerpt, Kurt Masur works with Huba Hollokoy on the ravishing slow movement of Mendelssohn's Italian Symphony (from www.masterclassfoundation.org). ON THE ITALIAN SYMPHONY TO SHARE . . .
. . . but I didn't -- or even anything sufficiently utilitarian to be worth cadging. So let's just run down the basic facts. Over a two-year-plus period between 1830 and 1832 the 21-year-old (when he set out) Mendelssohn made a "grand trip" that included a fair amount of time spent in Italy, where he was too busy to actually compose an "Italian symphony," which he set out to do when he finally returned home, after stops in Paris (where he met Chopin) and London (where he met Paganini [UPDATE: no, wait, I think that was on a later visit to London]). In May 1833 he conducted a highly successful premiere of the new symphony in London, but he was never satisfied with it, and his resolution to "fix" it kept him from allowing it to be published -- and then time ran out on him, in November 1847, two months shy of his 38th birthday. "it's too slow. it's﻿ not Italian at all...."
The performances have been chosen to suggest some qualities I think are worth noting in the music. By contrast, Kurt Masur's performance, with Mendelssohn's own Leipzig Gewandhaus Orchestra, seems to me to communicate a good deal more in the music -- fluidity, elegance, sophisticated exhilaration. It doesn't betray that speedy-sounding Allegro vivace tempo marking, but it has more dimension, more shapeliness, in the end more fun. I've heard lots of performances of this slow movement that make it sound prosaic and dull. Here we have two performances that in terms of tempo could hardly be more different but surprisingly achieve, for me at least, similar results: near-rapturous songfulness. Not many conductors could achieve this at either the velocity of Solti or the leisurely pace of Casals. There's so much liquid beauty in the latter that I would hate to give it up, but I really don't feel much sacrifice with Solti's performance -- it doesn't sound fast, does it? In the scherzo we again have a startling contrast in pacing. This time there's no question that Ashkenazy and Karajan are hearing the music very differently -- Ashkenazy focusing on the "movement" in con moto, Karajan really feeling the moderating influence of that moderato qualifier. It's a really big chance Karajan takes here -- and I think brings it off. As in the first movement, conductors commonly want to take this obviously quick-moving movement quickly. (And the Presto tempo marking certainly justifies it.) Not many of them, however, can maintain the kind of poise that Tennstedt does in what seems to me a quite terrific performance. At the same time, as with so many pieces of music where quickness is built into the fabric, it's hardly necessary, and can be counterproductive, to overemphasize that quickness, as so many conductors do. By contrast, Klemperer's performance (actually not all that much slower) certainly moves breezily while allowing room to incorporate dimensions of shape, color, and temperament. NOW LET'S LISTEN TO THE WHOLE SYMPHONY . . .
. . . in a performance of the quicker-is-better variety ("Mamma mia, that's Italian! "), but a pretty decent one. 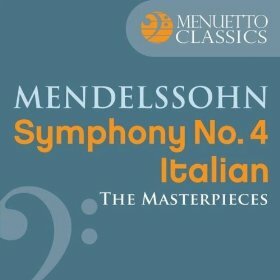 THE WHOLE ITALIAN SYMPHONY FOR $1.59! We hear Tchaikovsky's sextet for strings Souvenir de Florence.